Houston Endowment informed the Houston Independent School District this week that it will release a $3 million payment for the district’s Apollo school turnaround program in January. The Foundation deferred the final payment on its three-year, $6 million grant to the HISD Foundation pending its review of the project’s third year report by Dr. Roland Fryer of Harvard University. This entry was posted in Apollo 20 and tagged achievement gap, Apollo 20, education, HISD, Houston Endowment, Houston ISD, Roland Fryer on December 20, 2013 by HISD Communications. The Houston Independent School District is hosting several school choice fairs across the district to inform parents of the different educational choices available to their children as they transition into middle and high school. This entry was posted in Elementary Schools, Fine arts, High Schools, Magnet/School Choice, Middle Schools, Parents, Special events and tagged early college high schools, education, Futures Academies, HISD, Houston ISD, Magnet programs, magnet school, school choices, STEM on October 7, 2013 by HISD Communications. The Houston Independent School Districts is launching a new online application system for parents and students wanting to attend any of the district’s 115 magnet programs. While paper applications will still be accepted, HISD is hosting a series of orientation sessions to familiarize parents with the new online option and outline the multitude of school choices available. The first session will be on Tuesday, September 17 at 6 p.m. at Burbank Middle School, 315 Berry. This entry was posted in Elementary Schools, High Schools, Magnet/School Choice, Middle Schools, Parents and tagged Burbank Middle School, education, elementary schools, high schools, HISD, Houston ISD, Magnet programs, middle schools, Montessori, school choice, vanguard on September 17, 2013 by HISD Communications. The Houston Independent School District is inviting students from the Children First Academy, a charter school closed this week by the Texas Education Agency, to enroll in HISD. This entry was posted in Elementary Schools, Magnet/School Choice, Middle Schools, News, Parents and tagged Charter School, Children First Academy, education, Elmore ES, Fonwood Early Childhood Center, Forest Brook MS, Henry MS, HISD, Houston ISD, Key MS, Marshall MS, Scarborough ES, Shadydale ES on September 11, 2013 by HISD Communications. 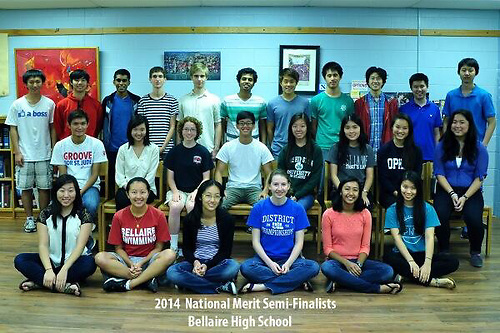 Sixty seniors from six high schools throughout the Houston Independent School District have qualified as semifinalists in the prestigious National Merit Scholarship Program. HISD had 56 semifinalists last year. The students are among 16,000 from across the country to earn the semifinalist designation, allowing them the opportunity to continue in the academic competition and vie for more than 8,000 college scholarships worth roughly $35 million. This entry was posted in Achievement/Recognition, High Schools, News and tagged Bellaire High School, Carnegie Vanguard High School, debakey high school for health professions, education, HISD, Houston ISD, Lamar High School, National Merit Scholarship Program, The High School for the Performing and Visual Arts, Westside High School on September 11, 2013 by HISD Communications. What: Lockhart Elementary will dedicate its new 750-student school, built under the 2007 bond program. Events will include student performances, special guest speakers and classroom tours of the new facility. When: Thursday, Aug. 22, 2013 at 9 a.m. This entry was posted in Elementary Schools and tagged 2007 bond program, education, HISD, Houston ISD, Lockhart Principal Felicia Adams, new schools, Rev. William Lawson, Trustee Paula Harris on August 20, 2013 by HISD Communications. The Houston Independent School District will kick off its pilot stage of the PowerUp program, a districtwide initiative to transform how teachers teach and students learn through technology, by delivering laptops to teachers at 11 campuses across Houston. A press conference will be held on Tuesday, August 13 at 10 a.m. at Austin High School, 1700 Humble. This entry was posted in PowerUp and tagged education, HISD, Houston, Houston ISD, Lenny Schad, powerup, students, technology, Terry Grier on August 9, 2013 by HISD Communications. The Houston Independent School District is partnering with Houston Community College to open two Middle College High Schools focused on serving students who are in danger of dropping out of school or who have already dropped out. This entry was posted in Board of Education and tagged education, HCC, HISD Board of Education, Houston children, Houston ISD, Middle College High Schools on August 8, 2013 by HISD Communications. In an effort to ensure a smooth transition for parents and students as the North Forest community joins the Houston Independent School District on July 1, HISD is hosting tele-town hall meetings to give parents the opportunity to ask questions directly to Superintendent Terry Grier and other administrators on May 29. North Forest parents will be able to participate in the tele-town hall meetings by calling the toll-free numbers provided. To participate in the English tele-town hall, parents can call toll-free 855-246-7045, extension 21856#. Spanish-speaking parents may call 855-246-7045, extension 21911# to participate in the Spanish town hall. HISD will also be calling all North Forest students’ households directly when the tele-town hall begins at 6:30 p.m. When: Wednesday, May 29th 6:30 – 7:30 p.m. This entry was posted in North Forest, Parents and tagged education, HISD, Houston ISD, North Forest ISD, Rhonda Skillern-Jones, Terry Grier, town hall meetings on May 28, 2013 by HISD Communications. For more than 25 years, the Houston Independent School District has been recognizing the dedication and efforts of all school librarians in the district. The Librarian of the Year for 2013 will be announced at the upcoming annual banquet on May 18, 2013. This entry was posted in Achievement/Recognition and tagged Chitra Banerjee Divakaruni, education, Houston ISD, Houston Real Men Read, librarian of the year, Millionaire Club Summer Reading, Name That Book on May 17, 2013 by HISD Communications.